Russia will try to test a new spacecraft docking system again Saturday (July 28) with an unmanned cargo ship at the International Space Station, after a first attempt earlier this week failed and was prematurely aborted. A robotic Russian Progress 47 cargo ship undocked from the space station on July 22 for the test, and will attempt to automatically link up to the orbiting outpost tomorrow at 9 p.m. EDT (0100 GMT July 29). The Progress 47 arrived at the space station in April, and had been attached to the Pirs docking compartment on the Russian segment of the orbiting laboratory. Russian flight controllers tried to test the new Kurs-NA docking system on Monday (July 23), but a technical glitch stopped the spacecraft from arriving at the space station. 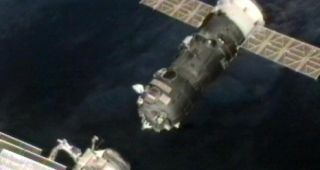 The spacecraft's onboard computers kept it a safe distance away from the orbiting laboratory while Russian engineers on the ground tried to diagnose the problem. "The Progress has been experiencing some issues with the new Kurs-NA system," Dan Harman, NASA's International Space Station manager of operations and integration, told reporters in a news briefing Thursday (July 27). "Right now they're continuing to work through those." The Kurs-NA docking system is an upgraded version of the Kurs system that has been used for years on Russian spacecraft. The Kurs-NA system features updated electronics, and is expected to use less power and improve safety. Russia intends to eventually use the newer automated system on future robotic and manned missions to the International Space Station. During Saturday's docking test, the Progress 47 spacecraft will approach the station to within roughly 29 miles (46 kilometers). At this point, the Kurs-NA system will be activated, and if the spacecraft appears to be performing well, Russian flight controllers will proceed with the automatic docking. NASA Television will broadcast live coverage of the attempted re-docking beginning at 5 p.m. EDT (2100 GMT) on Saturday. NASA TV can be viewed here: http://www.nasa.gov/ntv. The docking attempt will come just a day after Japan safely docked its own unmanned cargo spaceship, HTV-3, at the space station. The robotic freighter arrived Friday morning (July 27) to deliver a new batch of food, supplies and science experiments. If the spacecraft is unable to successfully perform the demonstration, the cargo ship will prepare to leave the station for good.The disposable Russian Progress ships are intentionally sent to burn up in the Earth's atmosphere at the end of their missions. Progress 47 arrived at the space station in April, and delivered food, clothing and other supplies for the crew living aboard the orbiting outpost. After the cargo onboard the spacecraft was emptied, the station crew filled the Progress with trash and other disposable items. If Russia encounters another glitch during this weekend's docking test, the upcoming launches of subsequent Progress and Soyuz vehicles will not be affected, NASA officials said.